The historic Arkansas town of Hot Springs, just 55 miles from Little Rock, is a prime weekend getaway destination for families, couples, or single travelers and offers a variety of great eats, local treats, and, of course, hot springs. 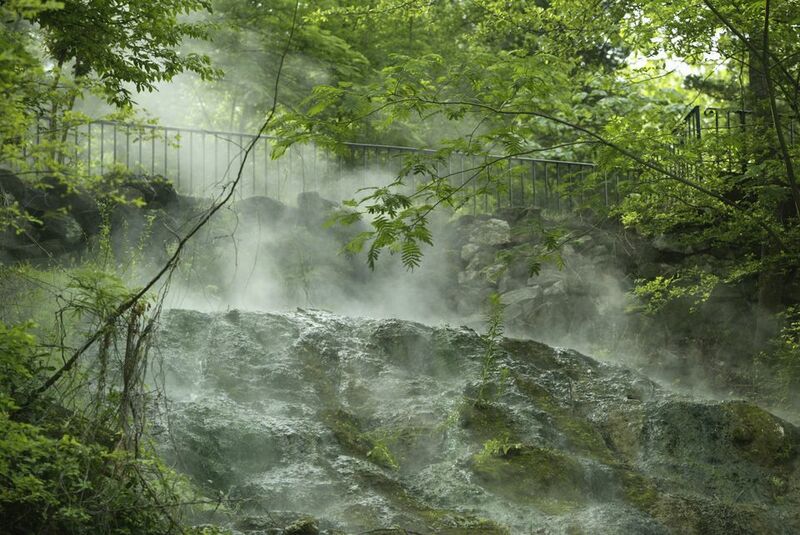 Hot Springs has something to offer every visitor; the nature lover will find hours of enjoyment there, as will the historian, the antique shopper, and the shopaholic. Most of the attractions can be found right on Central Avenue in Hot Springs' historic district. In this central area, you can find hiking trails leading you up the mountain, arts events like the documentary film festival, shopping, visitor information centers, and what Hot Springs is famous ​for—the bathhouses. There is no need to leave the main street if you are just coming on a day trip, but there are also a number of things to do around the area if you have a few more days to spend exploring. Naturally heated thermal springs can be found all over the city, but while most of these have been covered as a result of development, there are still a few active springs travelers can visit. Even in 50-degree weather, you can feel (and see) the heat that these springs give off. These springs are a natural wonder, but they also produce very good drinking water, dispensed from spigots found on the streets of the city. The spring water that comes out of these spigots is warm (on a cold day, it's just lukewarm) and people line up to get a taste. The water is so popular that one man hauled gallon containers from another state to take some famous Hot Springs water back home with him. Everyone's favorite use for Hot Springs water can be found on Bath House Row, where there are many historic bathhouse buildings lining the main avenue. Most serve other functions, such as visitor's centers and information buildings, and are no longer used for baths. In fact, the only operational bathhouse is Buckstaff, which is open year-round and offers thermal baths and massage for a relatively low price compared to other major cities in the United States. After your thermal bath, walk around downtown Hot Springs and check out the many little shops and boutiques. You can shop for antiques, toys, and apparel in unique and historic buildings. Hot Springs has been around for a while, and because it has always been a tourist attraction, there are lots of quirky roadside-type attractions to discover on the main strip. A newer attraction is the Hot Springs Gangster Museum. It's small but has some original artifacts, and the owners are friendly and informative. The tour might be a little boring for kids because it's very structured and scripted. However, you can learn that Hot Springs isn't just famous for its water, but also for gambling and other illicit activities. If you're a fan of horse racing, Oaklawn in Hot Springs is the home of horse racing in Arkansas. The track gained fame by producing a number of Kentucky Derby championship horses throughout the years. Open from January to April, Oaklawn offers an array of live, simulcast, and instant horse racing (historical race wagering). Outside of downtown Hot Springs, you'll find one of Arkansas' best botanical gardens, Garvan Woodland Gardens, located on a 210-acre peninsula on Lake Hamilton in Hot Springs National Park. Strolling through the gardens taking photos is a relaxing way to spend the day. Hot Springs hotels offer many amenities, but most have the best thermal spas in the region, drawing visitors from around the world to this small Arkansas town. The historic Arlington Resort Hotel and Spa opened in 1924 and was the biggest hotel in the state at the time. Presidents, celebrities, sports stars, and even Al Capone (he liked room 442 because it overlooked the Southern Club) have slept there. Another popular hotel in Hot Springs is the historic Park Hotel, which was completed in 1929. This gorgeous hotel building is a great example of Spanish Revival architecture. Hot Springs has many family-friendly attractions. In the warmer months, many families make a stop at the Magic Springs and Crystal Falls amusement park. However, even in the cooler months, there are many things to see that will keep kids occupied. The Josephine Tussaud Wax Museum, The Maxwell Blade Theater of Magic, and Pirates Cove Putt Putt are all popular family attractions that are right on Central Avenue along with the Mid-America Science Museum, one the best "hands-on" museums in the U.S. Tiny Town is a family-run attraction consisting of a series of handmade miniature villages and an interactive model railroad. It claims to have "the oldest kid-size village and railroad in the U.S." Tiny Town is a bit away from Central Avenue, but not that hard to find. A trip to the Hot Springs Mountain Tower, which takes you 180 feet above the mountain, will give you an idea of the grandeur of the city and its park. The mountain tower is just about five minutes away from Central Avenue, and the energetic can hike up to the tower from Central Avenue on one of the many hiking trails. Visitors hoping to experience the rich culture of food in this Arkansas town can start their day off with a trip to the famous Pancake Shop, which features one of the top breakfast menus in the state. Alternatively, visitors can check out Bleu Monkey Grill, a newer establishment that's great for some bistro-style American food. Rolando's is a great spot for lunch, with a menu of tasty Mexican food. For vegetarians, try Cafe 1217 to sample their fresh sandwiches, salads, and soups as well as a number of quick yet creative options that are mostly vegetarian-friendly. Later in the day, try McClard's BBQ, one of Bill Clinton's favorites. It's been ranked among the best in the state by multiple publications over the years.